In 2014, the world experienced the first-ever major Ebola epidemic. Over the following two years, nearly 30,000 Ebola cases were reported. More than 11,000 people died across multiple countries in West Africa. It was a devastating humanitarian crisis. The epidemic was addressed through traditional containment measures, such as case finding, quarantine and safe burial practices. Today, the world is experiencing its second-largest Ebola outbreak in the Democratic Republic of the Congo. This time, new technologies, including investigational vaccines and treatments, are being deployed. The emergence of these new tools was accelerated by leaders from the public, private and philanthropic sectors. The 2014 Ebola crisis showed that progress is possible when a health threat is elevated to the top of the global agenda. Now is the time for the world to apply this lesson to address the deadliest infectious disease, tuberculosis (TB). In recent years, TB has surpassed HIV/AIDS and malaria combined in terms of mortality, killing 1.6 million people annually. To put this into perspective, while 11,000 people tragically lost their lives during the course of the West African Ebola outbreak, in South Africa alone nearly 44,000 people died from TB during the same period. While TB has ceased to be a major public health concern in developed countries, more than 95% of deaths from TB continue to occur in low- and middle-income countries. This points to a connection between poverty and disease. Poverty facilitates TB in several ways. It thrives in poor living conditions, such as overcrowded and poorly ventilated homes that are conducive to the transmission of an airborne, respiratory disease. Poverty prolongs delays in diagnosis due to resource constraints. It also increases underlying vulnerability to bacterial infections due to malnutrition and immuno-suppressive co-infections such as HIV. Experts project that eradicating extreme poverty could lead to an 84% reduction in TB cases by 2035. Because this disease is concentrated in resource-poor parts of the world, there are few commercial incentives for the pharmaceutical industry to invest in innovation in TB. Inadequate and outdated medical interventions have fostered the development of multi-drug-resistant TB (MDR-TB), which is fuelling the crisis. Recognizing these challenges, Johnson & Johnson decided to act. Our commitment to TB is personal. Dr. Paul Janssen lost his four-year-old sister to tubercular meningitis in the 1940s. In fact, the Janssen Pharmaceutical Companies of Johnson & Johnson has invested significantly in the fight against TB over the past 20 years. In 2002, our scientists identified the first targeted TB medicine with a novel mechanism of action in more than 40 years, bedaquiline. 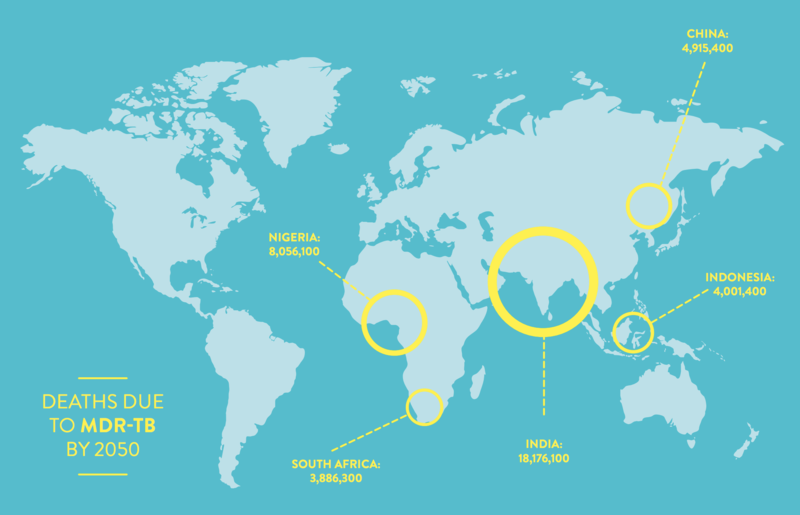 Since bedaquiline was approved by the U.S. Food and Drug Administration in 2012 for MDR-TB, Johnson & Johnson has invested significant resources to deliver more than 78,000 courses of this treatment to patients in 113 countries. Now a global movement focused on TB is emerging. In September 2018, the United Nations convened the first-ever high-level meeting dedicated to combatting TB. On the eve of this meeting, Johnson & Johnson joined forces with the World Economic Forum and other partners to co-host a TB Innovation Summit to accelerate research and development (R&D). Johnson & Johnson also announced a 10-year initiative to combat TB, with a triple-track approach focused on expanding access to current TB therapies, increasing diagnosis rates and investing in the necessary R&D. We are already implementing this initiative. In China, a country with one of the highest burdens of TB, we have entered into partnership with the National Health Commission, the China Center for Disease Control and Cepheid to undertake a screening programme for 10 million people. Together, we are bringing Cepheid’s pioneering GeneXpert rapid diagnostic technology to high-risk areas, enabling reductions in diagnosis time from weeks to hours, while simultaneously detecting for resistance to the most-used TB medicine. We are engaging in these programmes because as a global community, we have the means to end TB, thanks to new technologies and advances in R&D. I wholly agree with Klaus Schwab that the Fourth Industrial Revolution is opening up a new world of bold, disruptive thinking and innovation. The TB pandemic can’t be tackled by one company or government alone. We need to encourage industry as a whole to engage. New approaches to creating a robust and sustainable TB R&D ecosystem requires identifying new incentives for industry, new funding mechanisms, and engagement from all sectors. Importantly, we must protect the effectiveness of the antibiotics of the future, and end the scourge of MDR-TB. The evidence is growing that this is an urgently needed and fiscally responsible investment, one that national finance ministers need to take seriously. In 2015, a report by the UK Government found that if an additional 40% of TB cases become resistant to first-line drugs, by 2050 MDR-TB could cost $16.7 trillion to combat, reduce global GDP by more than 0.6%, and kill an additional 75 million people. At the World Economic Forum Annual Meeting 2019, a new analysis from the Economist Intelligence Unit, commissioned by Johnson & Johnson, will shed more light on the potential economic impact of leaving MDR-TB unchecked. Looking back, the 2014 Ebola outbreak in West Africa brought many important lessons about what’s needed for pandemic preparedness and response, and - crucially - a rapid wave of important innovation supported by the private sector. We must now implement these lessons. We must ensure that our collective technological and scientific capabilities are applied today to end tuberculosis. Delay is not an option.